The first Paul Blart movie was fairly inoffensive. Much like its titular hero, it was buffoonish and loud and something to simply shrug and ignore the idiocy. It had a couple funny moments tweaking action movie conventions, less so with Kevin James’ numerous pratfalls. The world didn’t need a sequel beyond the demands of the first one making money. And much like the Die Hard sequels, the “spiritual forbearer” of Blart, our security guard finds himself miraculously being put in the same miraculous position again, this time in a different location. 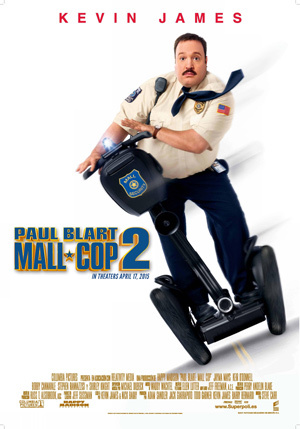 While Die Hard 2 is a fairly mundane follow-up, Paul Blart: Mall Cop 2 is a true test of everything we hold sacred. Midway into the movie, I thought my review was just going to be my unintelligible suicide note. 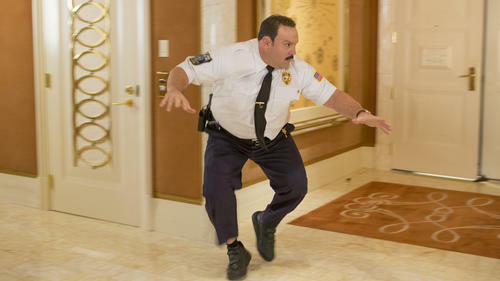 Blart (James) is in Las Vegas for an annual security convention. He’s brought along his teen daughter Maya (Rami Rodriguez) for some valuable father-daughter time, especially in light of Blart losing his wife and mother. It’s at this convention where Blart runs across a team of art thieves lead by Vincent (Neal McDonough). It’s up to the most unlikely mall security cop to save the day again, Vegas-style. Oh, and when traveling in Vegas, make sure to stay at the luxurious Wynn Casino and Hotel. Can I get a check too for the self-promotion like this movie? Kevin James laughs at your pain. Somewhere along the way, James and co-writer Nick Bakay decided the lovable lug needed to be a modern-day Pagliacci and be the crying clown America deserves. The opening act feels like notorious cinematic sadist Lars von Trier designed it. In the opening minutes, Blart’s wife (Jayma Mayes) divorces him not even a full week into marriage. She couldn’t stop vomiting from the thought of being married to him (this literally happens). His mother is run over and killed by a milk truck. His daughter has been accepted into UCLA but fears telling her father this joyous news because she doesn’t want to push him over the edge. This and he’s still emasculated and looked down upon by an assortment of industry peers at the Vegas convention. All of this culminates in Blart becoming a paranoid, overbearing bully who loses the sense of likeability that comes naturally to James even in dreck. Take a moment where Blart intervenes with his drunken friend. The guy has been obnoxiously making sexual advances on a woman (played by Adam Sandler’s wife) who just wants her privacy respected, and Blart saves the day by… convincing the woman that she should be flattered by the drunk’s advances. Yeah. He rejects his daughter’s academic accomplishment and demands she attend a lesser school closer to home for his own selfish benefit. He’s pushing her away. Then there’s the weird ongoing joke about his arrogant assumption that an attractive hotel employee is hitting on him; he’s dismissive of her throughout and, here’s the weird part, it ends up working. She falls for him (“I can’t say no to you”). That’s right folks, Paul Blart successfully “negged” himself a date. He’s not a loveable loser any more. He’s just an angry, bullying, self-pitying loser. There won’t be a joke (I’ll be charitable and refer to them as “jokes”) that you won’t see coming a mile away and still roll your eyes when they arrive. When the movie has an exotic bird walk out, you know it’s only a matter of seconds before it comically engages in a fight with Blart. When he steps back onto the familiar confines of a Segway, you know it’s only a matter of seconds before he does something stupid. The crux of the humor of this movie is about 90 minutes of a fat guy falling down, and it still takes 47 minutes for the plot to get in gear. Let me repeat that for those in the cheap seats: a movie that is built upon the frail premise of being a Die Hard parody takes 47 unholy minutes to actually have its plot kick into gear. I watched Blart fight a stupid bird before the movie had the villain’s scheme play out. Naturally, the film would have been bereft without that man-on-bird action (sorry to disappoint those who came here vis-à-vis a salacious SEO keyword search). Likewise we needed 28 shots of James falling over. Anything less would have been unacceptable to the viewing public. If you’re going to be a dumb comedy just be a dumb comedy and don’t waste my time. And oh what a dumb comedy it is. The first Blart film wasn’t going to be confused with Tom Stoppard but it at least had some action conventions it could tweak. This go-round can’t even manage that, and so we’re inundated with tired slapstick and comedy that rarely rises above the most obvious joke at every opportunity. Blart gets ready to attack an intruder and, wouldn’t you know it, he ends up punching an old lady. Hilarious. Even funnier is that the injured hospitality worker apologizes to her attacker. There’s also a thinly disguised gay panic joke where Blart freaks out when a guy eats a brown banana. Who cares about how brown a banana is? At one point Blart hides inside a suitcase positioned at the top of the stairs. Why? Well so that the suitcase can fall down those stairs and hit the bad guy in the head. Don’t you get it? He’s fat. There are few comic setups or developments, no payoffs. Scenarios that should be comic, like Blart stumbling on stage of a Vegas dance show, are practically played straight, with the visual of Blart cavorting his large torso as the only joke itself. In case you forgot, he’s fat. 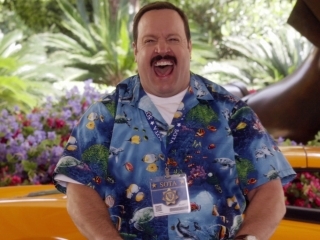 I should not have been expecting much from Paul Blart 2 simply by the choice of jokes highlighted in the trailer. If you wanted a cursory reminder, it included Blart fighting a bird, Blart punching an old lady, Blart running into a plate glass window, and Blart getting kicked by a horse in what should be a spine-obliterating accident. 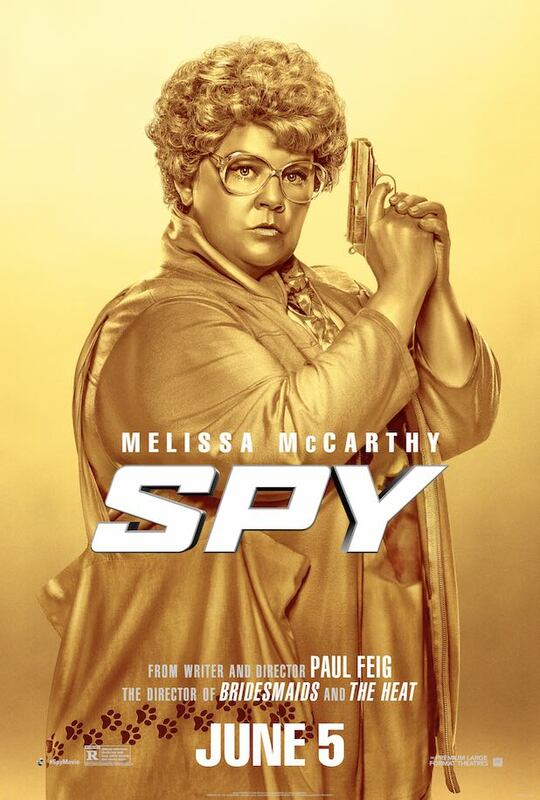 Let’s take this last gag and really explore how it’s indicative of Paul Blart 2. The foundation is a dumb act of slapstick, but that’s not good enough and so it’s exaggerated to even dumber magnitude. With the help of self-loathing CGI artists (they can’t all be Jurassic World), Blart ricochets across a street and violently bounces against a car door. It’s not enough that a horse kicks this guy; he has to get kicked by a super horse because it just wasn’t funny enough. That sums up the comic ethic of Paul Blart 2: when stupid isn’t enough, amp it further, and then be proud about what you’ve done. It feels immeasurably satisfying to finally have the Pixar we all fell in love with back and running. There’s been a sharp decline in the company’s quality since 2010’s Toy Story 3. Did we really need a sequel to Cars and a prequel to Monster’s Inc.? It started to look like Pixar was steering away from the kind of bold and brilliant storytelling that had earned its audience trust. With Inside Out, Pixar tackles the intricacies not of the secret world of toys, bugs, monsters, or sea life, but of the human brain itself and our embattled emotions, finding new ways to wow us once again and remind us just how magical the right combination of story and storyteller can be. 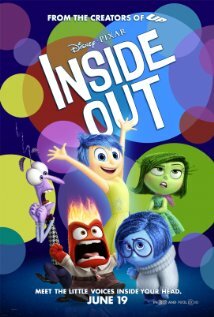 Inside Out is a luminescent piece of filmmaking, brimming with intelligence, imagination, and it is powerfully moving while also being deeply relatable and entertaining. In looking inward, Pixar has found the path out of their recent rut, and Inside Out is a shining example of their ingenuity. Inside 11-year-old Riley is a complex world. Five primary emotions help oversee her day-to-day functions; they’re the caretakers of Riley. Joy (voiced by Amy Poehler) is the effervescent leader of the bunch, along with Sadness (Phyllis Smith), Fear (Bill Hader), Disgust (Mindy Kaling), and Anger (Lewis Black). These five are entrusted with Riley’s well being and her memories. Riley’s core memories, the moments that make up who she is, help to form personality islands: honesty, hockey, goofball, and family. Riley and her family have recently moved from Minnesota to San Francisco, and Riley’s having a hard time adjusting. Her parents don’t know what’s happened to the daughter they knew. Sadness seems to be “tainting” Riley’s memories, and Joy tries her best to keep Riley happy at all times. Joy and Sadness get accidentally sucked away wrestling over Riley’s core memories. They’re sent to the outer reaches where the aisles of long-term memories are vast. The two emotions have to work together to get back to headquarters before the remaining emotions convince Riley to run away from home. Even just reading that again, it’s easy to see how complicated this movie can be with its world building and internal logic, and yet under the guidance of director Pete Doctor (Up) and his writers, the movie is at no point confusing. Pixar once again does an amazing job of guiding you through a new world and its various parts, all while expanding and complicating this environment while staying true to its internal logic and keeping an audience properly oriented. I can’t imagine many screenwriters would be able to tell this story while still being as clearly understood. The simplicity of the story, the ease to follow along, the natural development and connection of the storylines and characters coming together, is the greatest credit one can offer. It’s ostensibly a buddy adventure film like many Pixar tales, with the unlikely team of Joy and Sadness having to find their way back to headquarters and learning important life lessons along the way. It’s also a smart way to explore the various other elements at work in Riley’s brain. It’s not just an interesting descent but each new station further opens up Riley as a character. Her subconscious (and fear of clowns), her dream theater projections, her working abstract concepts, all tie back together in satisfying ways. Though the greatest side character is unquestionably Riley’s former imaginary friend, Bing Bong (voiced by Richard Kind). He’s wandering around her memories, and at first you have your suspicions, but then you realize, like the other characters, that he just wants what’s best for Riley. Coming to terms with the fact that Riley has moved on, and his time, while cherished, is now left behind, is a complete character arc, and that’s for a comic side character. Oh, and if you’re like me, Bing Bong’s conclusion just wrecked your tear ducts. You know you’ve watched an impactful film when even thinking back on moments starts the process of tears welling in your eyes. It’s somewhat strange to think about characters as ephemeral as emotions and imaginary friends and the like, but they really work on two levels: the emotions themselves are exaggerated figures with distinct points of view but they also better inform the whole of Riley. There’s a depth there that gets even more impressive the more you analyze the creative process. What’s also impressive is the vital message of the movie, which is that growing up is hard and that being sad is okay. Seriously, the journey of Joy is to accept that being sad isn’t necessarily an emotion to minimize but a vital part of being human and an essential process. Much of the conflict that drives Riley is her avoidance of being sad, her postponement of accepting her real feelings and accepting that San Francisco is not going to be like her old home. It’s also a realization that to be a fully functioning person, you have to own the sadness in life. When Riley eventually unburdens herself of all her troubles and fears, and the tears flow, that’s when the healing can begin, and that’s when her parents swarm in for the group hug, and even now my eyes are starting to water. Damn you, Pixar. 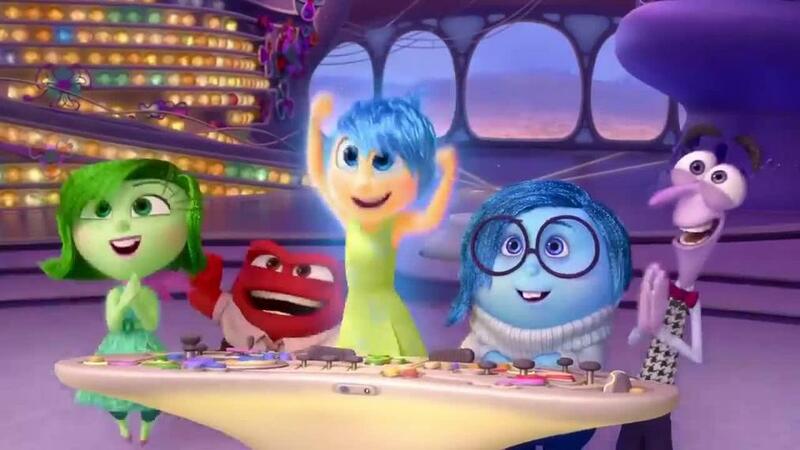 Don’t be mistaken by my words thus far, Inside Out is also a wonderfully funny and inventive comedy. The sense of discovery with the movie is alive and well, and each new revelation of Riley’s inner mind adds to the fun. The jokes are consistently paced. The vocal cast is expertly chosen and each emotion gets some good jokes. There’s a terrific running gag about a catchy jingle that the memory workers just enjoy kicking back and forth for their own impish amusement. The film dives into other minds other than Riley’s, including both parents trying to communicate during a family dinner meant to soothe their daughter. It doesn’t lean too heavily on tired gender stereotypes when it comes to the differing thought processes of men and women, which is a relief. During the end credits, we zoom into the mind of a schoolteacher, a bus driver, and a dog and a cat, and it’s an enjoyable way to leave the theater and gather yourself emotionally. The greatest comic asset is Joy, particularly as voiced by Poehler. As fans of TV’s Parks and Recreation can attest, Poehler can make insufferable optimism endearing, tip toeing around what should be annoying and instead finding stronger comic rhythms. If you’re looking for the closest thing to an antagonist, it’s Joy who got the whole mess started and yet we don’t ever really side against her. Part of that is because she’s not doing what she does as some weird power play but because she wants what, she thinks, is best for Riley. The other part is because Poehler is such a skilled vocal performer. If I had to find some point to quibble, the world isn’t as beautifully realized in a visual sense as other Pixar classics. I think this was a deliberate decision to ground what is such an unusual environment into something a little more familiar and less flashy. I also don’t think that Disgust seems as well articulated as a necessary emotion. She’s well played by Kaling but her application seems lacking in comparison to the other four main emotions. It’s remarkable that the summer is still young and already we have two instant classics in theaters; first Mad Max: Fury Road and now Pixar’s Inside Out. I’m still riding high from my screening, but I’d feel safe to call this a top-three Pixar film. I wouldn’t even begrudge those who cite it as their best. Far more than a big screen version of the 90s comedy Herman’s Head (anybody remember this one? ), this is an exceptional animated film that will appeal to all ages but, I suspect, hit adults even harder than their little ones. It’s a wonderfully poignant film about the struggles of growing up, of holding onto your past definitions of yourself, of accepting the full barrage of emotions, including the necessity of sadness. It’s relatable in many aspects and this further compounds its power. It’s dazzling with its creativity, it left me cackling with laughter (a superb Chinatown reference almost had me fall out of my chair), and it left me weeping at various points. 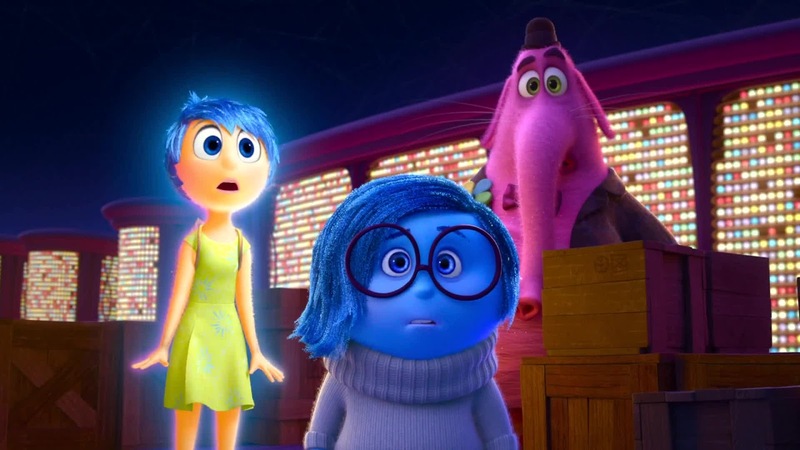 Inside Out is a return to form. This is the Pixar we remember. Director Colin Trevorrow won the proverbial lottery after his 2012 film, Safety Not Guaranteed. The charming indie gem won many hearts, one of them Steven Spielberg. Trevorrow went from a rom-com that was made for under a million dollars to directing a Jurassic Park franchise reboot. Even last year’s Godzilla director, Gareth Edwards, had a previous film that somewhat primed a logical path for his impressive new gig. Enough time has passed for Jurassic Park to be new again, and the extra varnish of cutting-edge special effects, high-profile stars, and a renewed sense of fun remind us just how universally enjoyable it is to watch dinosaurs and then watch dinosaurs eat people. Jurassic World has been open for a decade plus now and audiences are getting bored. As a result, the board of directors for the park is looking to “up the wow factor.” They’ve genetically engineered a new hybrid dinosaur (Indominous Rex) that has never existed before in history, but nothing bad could happen, right? Owen (Chris Pratt) is a Navy trainer who is working on training a group of raptors to follow commands. A security leader (Vincent D’Onofrio) is convinced that there’s money to be made with military applications if dinosaurs can follow orders. Claire (Bryce Dallas Howard) is in charge of the day-to-day operations at the park. Her nephews (Ty Simpkins, Nick Robinson) are visiting as one last holiday adventure before mom and dad get divorced. She knows little about her nephews (she’s a workaholic – what originality), but when they’re put in mortal danger, Claire’s protective nature kicks into overdrive. The Indominous Rex escapes its paddock and heads from pen to pen deeper into the park, killing for sport. It’s up to Claire, Owen, and a team of trained raptors to stop this newest monster. What Trevorrow and his Safety writer Derek Connolly do well is establish a summer thrill-ride that places fun above all else, and it achieves this goal. Jurassic World is consistently entertaining and engaging, with action sequences that are shorter but constantly push the narrative forward. With all the Jurassic films, there’s a palpable sense of dread, of holding back before things get really nuts, and Trevorrow has fun teasing an audience; however, he also delivers on what he promises. The dinosaur action is visceral and rather violent for a PG-13 film, but the segments are diverse in orchestration that it never feels like the movie is repeating itself. That’s quite an accomplishment considering that the Jurassic sequels have mainly been a series of chases. There’s a definite nostalgic reverence for the original 1993 film, summed up with Jake Johnson’s geeky control center character. Trevorrow takes more than a few nods from the almighty Spielberg with his own directorial style. There’s also a surprise sense of humor, which can be quite amusing in moments and far too comically broad in others, like the forced screwball romance between Owen and Claire. The story this fourth time is less a cautionary tale of science and more of a monster romp, imploring a finale that feels reminiscent of Godzilla being called out to save the rest of us tiny humans from the newest and biggest monster. It feels like Trevorrow and Connolly accepted they would never recreate the magic of the original, so they’re aiming to just make the best sequel possible instead. If you’re looking for dinosaur mayhem, Jurassic World has plenty and a sense of what makes summer movies work, mixing in the right amount of suspense, humor, and well-crafted payoffs. There are a few subplots that have to be swallowed or ignored for maximum benefit. The Raptor Force Five subplot is either going to be cool or silly, or both, and will go a long way to determine your overall feelings on Jurassic World. 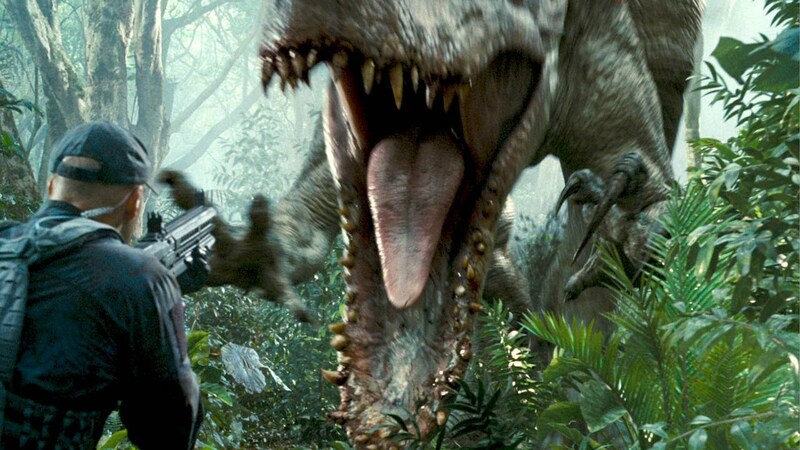 I know this idea has been in the works for several Jurassic sequels, so there doesn’t seem like there was ever going to be a movie that did not involve raptors being trained into some kind of combat role. This subplot connects to other points in the film about the nature of control/accepting being out of control, the building of a relationship, and the coordination for corporate interests. There’s a reason that the Indominous Rex seems to have special abilities that the handlers were not informed about, and this will be carried over into an assured sequel. For me, I thought the raptor hunting party was more fun than dumb. It had a Disney Wild Adventure feel for it, like we’re crossing over into Call of the Wild. I liked making the raptors allies to the humans who could be rallied for the final fight. I appreciated how thought out the world building was; Jurassic World feels like a living, breathing amusement park in operation. From the Seaworld-like Mosasaurus aquatic shows, to the baby dinosaur petting zoo (I would totally spend hours there), to the celebrity-recorded comedy bits educating riders about safety supervision, to the listless park employee wishing each new rider to have a happy day. During the pterodactyl attack sequence, which is the most frenzied and exciting sequence, the crowds run for cover, including one guy who runs away while still carrying a clearly identified margarita in hand. That’s fantastic because it means that the park probably has a cheesy pun-laden menu of adult beverages (Tea Rex?) but it also means that even during an attack, a customer is determined not to lose his, likely, $10 margarita. While the “we can’t close the beaches” corporate mentality is somewhat tired as a plot obstacle, it’s still entirely fitting in a modern setting. It was the little details that told me that Trevorrow and company really thought the premise through and made their world feel far richer. One could also look at the social commentary in a fairly cynical manner and find Trevorrow giving in to the summer movie machine. Claire’s character explains that after years of operation, the public has grown tired of dinosaurs, and so they have to engineer a new bigger, badder dinosaur just to grab flagging interest. What once was magical has now become accepted and everyday. It’s easy to apply this critique on movie audiences themselves; we’ve become jaded from movie spectacles. What once blew our minds, like the original Jurassic Park, has now become passé. We’re constantly looking for the shiniest new toy but will lose interest soon enough. And then there are the fleeting images of people being more involved with their cell phones than the spectacle they paid to see. That’s right, annoying moviegoers who are unable to break from their phones for a two-hour window, Jurassic World is making fun of you, and rightfully so. The chief product of this desperation to give the audience what it wants is Indominus Rex, a beast that slashes a rampage through the island. 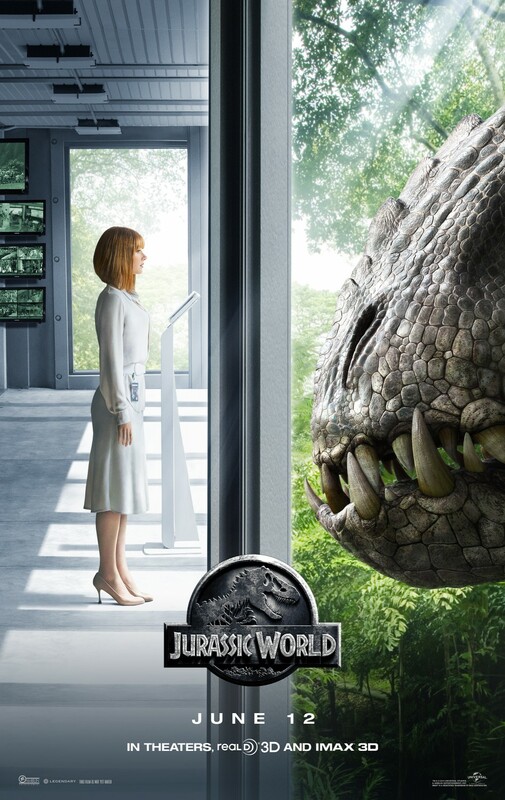 In a sense, Trevorrow is externalizing the audience’s demands into the antagonistic monster, and finally just gives in, essentially saying, “This is what you want, right?” I can’t tell whether the social commentary holds up well, especially with the end that relies upon a metaphorical power of nostalgia to conquer the manifestation of audience apathy, or if Trevorrow just gives up. Is the concluding monster-on-monster brawl just mass appeal pandering? I have a major solution to this dangerous park scenario. First, only herbivores allowed. Is any person going to reasonably refuse to go see millions-year-old multi-story extinct creatures because they primarily eat plants? I’m sorry, no way. That right there would solve most problems if the animals inevitably get loose. I would not believe a single person who would refuse to see living dinosaurs just because they lack a T.rex or other predators. That’s like Internet cretins refusing Angelina Jolie as a one-night stand because they don’t like the way her knees look. Nobody is this picky when awe-inspiring greatness waits. From a legal standpoint, I would also make sure guests sign a waiver before entering the park, thus mitigating any potential lawsuits over being attacked and eaten. How expensive is this park by the way? You have to charter a boat off the coast of Costa Rica, so that sort of price range already eliminates plenty of would-be customers. I know many millennials who consider Jurassic Park to be their own Star Wars, a film that delighted the imagination and imprinted a love of movies at a young, impressionable time. Movies have never been the same since, especially in the sea change of computer generated effects replacing practical (Oscar-winning Sam Winston is retiring because of our over-reliance on CGI). We all want to experience that sense of awe again, like when we saw the T.rex roar for the first time. 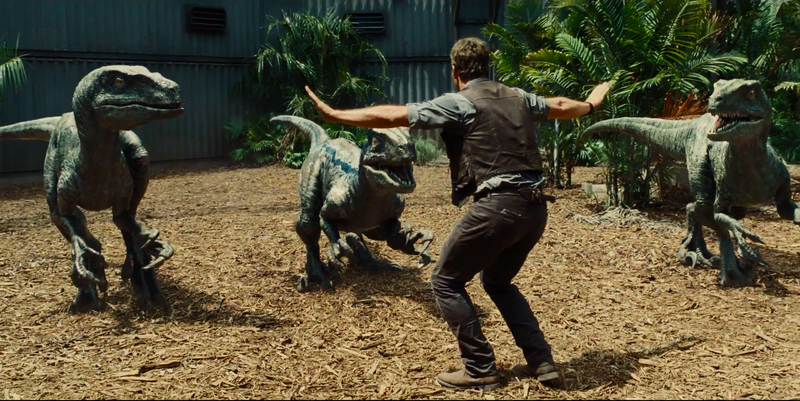 Movie moments like that send shivers but they are rare, so it’s unfair to compare Jurassic World to Park. However, it’s fair game to compare it to the lesser sequels, and that is where World stacks pretty favorably. Its sense of fun above all else, while remaining true to its larger vision of a real park, is a satisfying summer diversion. The dinosaur mayhem is satisfying and occasionally scary. The script does just enough to keep you from wanting to watch the human characters get squashed. In the wake of its box-office shattering opening weekend, expect the park to stay open. Sometimes all you want with a movie, especially a disaster movie, is some good dumb fun, and sometimes that fun is a little too dumb. Such is the case with San Andreas, chronicling massive earthquakes shredding California. After a slightly clever opening, the film goes rapidly downhill as we’re stuck with one-note stock characters. The Rock and Carla Gugino as a divorced couple who will, naturally, be brought back together over the course of events. They also have to travel to San Francisco to save their daughter (True Detective’s GIF-exploding Alexandra Daddario). I have to admit, that is one hell of an attractive family. There is no loser in that gene pool. From an action standpoint, San Andreas does a serviceable enough job with a few memorable images of Mother Nature’s fury. The script is definitely an excuse to just get from one big falling thing to another. I’m not expecting Shakespeare but the story shows very little effort. Oh no, the record-breaking earthquake is going to broken by another newer record-breaking earthquake. Oh no, a small child is huddling in a corner and needs to be saved. Oh no, a character is deprived of oxygen for like five minutes onscreen but magically comes back to life. If that doesn’t cause brain damage this script will. One of the problems with San Andreas is that it doesn’t have any real disposable characters. These kinds of movies thrive on having meat for the grinder, but from the first act onwards there’s nobody we truly fear will bite the dust. There was one major missed opportunity: the cowardly step-father (Ioan Gruffudd) abandons others, narrowly escapes disaster, and he should have continued doing so, avoiding another near-certain demise just to intensify the audience’s demand for his end. It would have been a satisfying payoff. Oh well. San Andreas starts to become a lot of hollow PG-13 carnage. Watching this gave me a further appreciation for Roland Emmerich (2012, Day After Tomorrow), who has such a better handle on large-scale destruction. That man knows how to make good dumb fun disaster movies peppered with all sorts of visually arresting images. 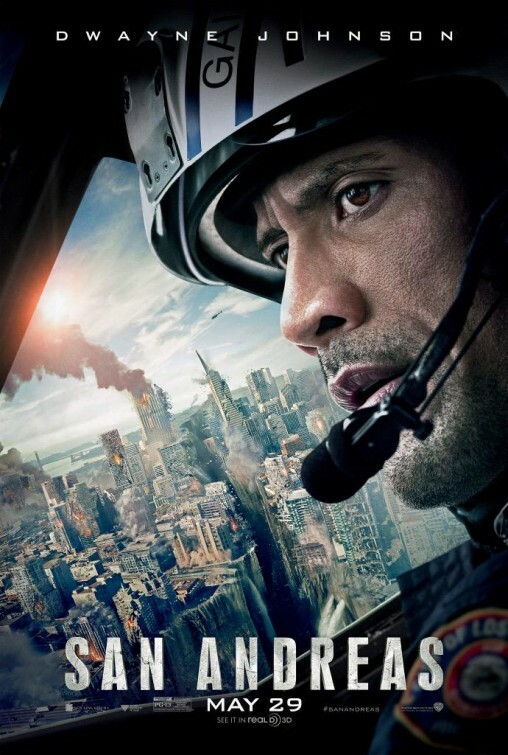 If you’re desperate for disaster, you could do worse than San Andreas and its onslaught of CGI thrills, but you could certainly do better.